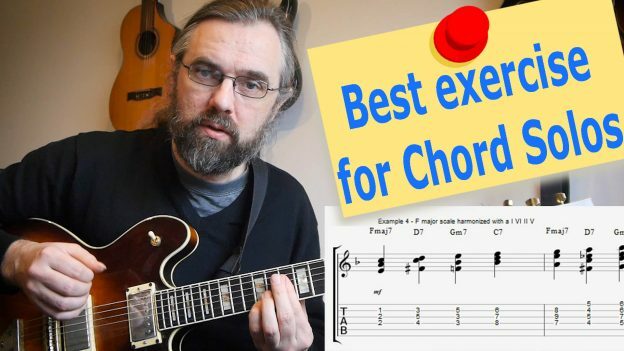 Best exercise for jazz guitar chord solos! Chord solos have been a part of the Jazz Guitar skill set since the 50’s and 60’s when players like Joe Pass and Wes Montgomery used it in their music. A Chord solo is a harmonized melody line, so you don’t only improvise a melody, you also harmonize it by adding chords to it. This might seem a little scary to start working on, but if what you want to work on is harmonising melodies. One of the simplest melodies you can harmonize is a scale, so in this lesson I will take an F major scale and show you how you can harmonize it with both some chords and some progressions. This material I will also put to use in some chord solo licks that I have written over a turnaround in F.
The scale that I am using for the exercises is this segment from the F major scale. It is on the top two strings because then it is easier to put a chord under it. In the exercises I might choose to move notes between the strings depending on the chords and voicings. For me it is easier to play the chords with enough control if I use my fingers on my right hand. You can of course do this with a pick or with your thumb. Just make sure that the melody is clear when you play. It is quite common for students to focus only on the chord and forget that it is actually a melody with some chords under it. Notice that I often use the same chord for several melody notes. This is purely to make it practical and easy to play. Another point of interest is the Bb. This note does not sound good over an Fmaj7, so I harmonize it with a Gm7. You can do several things in terms of choosing chords or even just changing the Bb to a B and play a Fmaj7(#11). What you end up doing is a question of the context and your taste. In example 2 I harmonize the same scale with a Gm7 chord. Here again I am using the same “chord” over several notes. The difficult note is in this case an E. I opted for a Gm13 voicing, but you could also use a C major triad or Am7 passing chord. You probably want to work out your own versions of these exercises for a few of the chords in F major, so I, II, IV, V, VI and maybe also try it on some harmonic minor or altered scales for some of the common dominants like C7 and D7. Once you can get through the scales with one chord at a time then you can start using a progression so that the chords change along the melody. This is getting you a step further in being able to play chord solos. So here we get a bit in trouble with the Bb on an Fmaj7 again, but here I solve it by making it a B. In that way I am able to keep the Fmaj7 there, since it would be problematic to just sub the chord for another chord. This get’s us into trouble already in the first bar. The F and D7 chords are fine, but we end up with a Gm13 and a C7sus4 because there we have the E and the F as melody notes. For the rest it is quite easy to go up the scale. In the last bar we have an E over the D7. While this is possible a D7 in this context would really ask for an Eb. I could have changed the note but opted for a Dm7(9) chord. Another option would have been to use an Abdim chord. To demonstrate how I come up with chord solos I have written three examples of chord solo licks. They are all on a medium I VI II V in F major because that is a common progression especially in the types of pieces where you might play a chord solo. In this first example I am starting with a scale run over the Fmaj7. This is moving from the A down to E harmonized with two different chords. THe D7 is using the same C,F# tritone with first an Eb and then an F in the melody. On the Gm7 I am using an ascending scale run from D to A. On the D and F I am using a Bb triad. The E is harmonized with a C major triad which is also easy to play. The last chord is a C7 altered. and is really just using the same voicing but first leaving out the top string. It is important to take care to make strong melodies when playing chord solos which I hope to illustrate with this example. In the last example I start out with a a scale run on the Fmaj7 up to the #9 on D7. From there I it moves down to the Eb and then skips up to an Bb over the D7. This is achieved by using the same voicing but just adding the Bb on a higher string. This is a great smooth way to deal with the skib from Eb to Bb. On the Gm7 I am using a simple melody consisiting of A and G which is harmonized with the same chord. The C7alt is a repeating note and chord which then resolves to Fmaj7. Conclusion: Make your own exercises! So what you have to remember with this material is that you will learn the most if you make your own exercises that use the voicings you are comfortable with and you know the sound of. This will also help you figure out how to go through the scales and solve the problems that give, which is also very helpful! Chord Solo transcription and Lesson! This entry was posted in Blog, Lesson and tagged block chords, chord solo, harmonized solo lines, Joe Pass, wes montgomery on February 16, 2017 by jens.